Where exactly is the Isle of Man? How big is the Isle of Man? How many people live on the Isle of Man? Is the Isle of Man considered its own country? Does the Isle of Man have its own currency? Are there campgrounds… or is wild camping allowed on the Isle of Man? How much does food and lodging cost on the Isle of Man? What attractions should I see and experience on the Isle of Man? And would the Isle of Man make a good destination for a week-long bicycle tour? These are just some of the questions I asked myself as I began preparing for a 6-day bicycle tour on the tiny island nation known as the Isle of Man. After arriving in Dublin, Ireland on August 10, 2014, I booked my round-trip ticket to the Isle of Man online using the Steam Packet Company website. The ticket cost me 58 Euros (54 Euros for the ticket and 4 Euros more because I paid with my Visa credit card). Then, on the morning of August 12th, I made my way to the Steam Packet ferry terminal on the north bank of the River Liffey, approximately 6 kilometers east from the city center of Dublin, Ireland. Even though I had purchased a foot-passenger ticket and not a vehicle ticket, I arrived at the terminal on my bicycle and was told to wait with the other vehicles in a sort of temporary parking lot just outside the main Terminal 1 boarding area. When the ferry arrived in Dublin, however, and all the people and vehicles from the ship had been successfully offloaded, my bike and all the people and cars in the queue were loaded on board the 96-meter-long Manannan. With four powerful Caterpillar 3618 marine diesel engines, storage for as many as 200 vehicles, and space for 850 crew and passengers, the boat felt almost empty as we soon thereafter left the port and began making our way toward the nearby Isle of Man. There were probably only 50-75 passengers on board. The trip from Dublin to the Isle of Man took about two hours to complete. On board the ship, I took a seat in one of vehicle’s many spacious seating lounges and did some online research about this tiny island I would be calling “home” for the next five nights. As it turns out, the Isle of Man (occasionally referred to simply as “Mann”) is not necessarily its own country (even though it does have its own currency – the Manx pound), but is a self-governing possession of the British Crown. The Isle of Man is an island with a land mass of approximately 572 km2 (or 221 square miles) and is located in the Irish Sea between the islands of Great Britain and Ireland (see the map above… or click here). Even though the island is quite small, the Isle of Man boasts a healthy population of approximately 85,000 citizens and several thousand more tourists at any time each year. When the ferry boat arrived in Douglas (the Isle of Man’s largest city… and also its capital), I quickly cycled off the boat and made my way into town, where I purchased food and drinks for the next day or two… as well as a SIM card for my smartphone that would give me unlimited text, phone calls and (most importantly) data for the next 7 days. I purchased the SIM card from a company called SURE at 35 Strand Street in Douglas and paid £5 pound ($8.30 USD) for the service. With my food, water and SIM card sorted, I cycled west out of town and up a short, but steep hill, toward the Douglas Lighthouse and the Great Union Camera, which you can see in the photo below. The Great Union Camera is an eleven lens camera obscura that projects an image of its surroundings (in this case, the area surrounding the city of Douglas on the Isle of Man) onto a screen in its interior. The Great Union Camera was closed when I got there, but I did get to see the obscura from the outside at the very least. It was well after 5 pm by the time I left the south-western edge of Douglas and began making my way west along the shoreline. “Shoreline” is probably not the best word to use, however, as there were large and impressive “cliffs” that seemed to jump straight out of the sea and end only a few feet from where the road began. Riding along these seaside cliffs, a cold, icy wind blasted me in the face and I knew this might be the type of cycling I would encounter all over the small island. Ignoring the wind for a moment, however, I was able to take in some incredible “shoreline” views. Because night was quickly approaching, I needed to find a place to sleep and set up my tent for the evening. Using the power of the Internet (mainly Google Maps and my offline mapping application (MapsWithMe), I was able to scout out in advance a small patch of trees just outside Port Soderick Glen where I thought I would be able to stealthily camp for the night. It didn’t take me long to reach this small collection of shrubbery near the sea, but finding a flat spot on this hilly, island ledge was going to prove difficult. So, after a few minutes of scouting out the location on foot, I decided to pick up my bike and carry it into a dense, wooded (almost jungle-like) area between the parking lot and a major fork in the road. The only problem was that there was a steep three foot ledge I needed to get my bicycle up, and lifting my 100-pound bicycle up this muddy, wet ledge was not going to be easy. On my first attempt at scaling the small hill, I slipped and fell. My knee dropped down into the earth beneath me, while my bicycle slammed down on top of my other leg, and then I slid a few inches in the direction I did not want to go – down. After another two attempts, I was able to get my bicycle and my now bloody body up the small embankment and into the forest that would be my shelter for the next 14 hours. I laid my bicycle down in an area where passing cars and people would be unable to see it and then went about setting up my tent. I slept well that evening. Even though I was sleeping on a slight incline (something that would normally keep me awake at night), I slept like a baby and woke the following morning to the sound of rain falling from the trees above onto my tent’s exterior rain-fly. Once the rain stopped, I packed up my tent and loaded up my bicycle. Then I crawled out from inside my secret roadside campsite and began cycling west. During my first two nights in Ireland I stayed at the home of a man named Colin, who suggested that when I was on the Isle of Man, that I cycle down a small side road that would take me to a remote, but beautiful beach. I followed his suggestion… and this is where that road took me (see the photo below). Even though the wind was howling in this location and it appeared as though it might rain at any moment, I decided to use the bench that was available here as the location in which to eat my lunch. With this tiny corner of the country almost entirely to myself (a couple walking there dog would walk past every once and a while), I sat in silence as the wind whipped across my body and I stuffed a small vegetable sandwich into my mouth. The Isle of Man is a very small place, so if you are going somewhere and you are in a hurry, you can get there in a surprisingly short amount of time – even on a bicycle. You can also spend several hours cycling around in circles, exploring the little side-roads and trails and can be found all over the island. This is why, after cycling for less than an hour, I was able to reach the city of Castletown on the island’s south-western shore. I didn’t spend a whole lot of time in Castletown, nor did I pay to explore the castle that can be found there, but I did stop to take a few photos and explore some of the city’s side-streets before continuing my bike ride to the island’s most westerly point near the city of Port Erin. In order to get to the island’s most westerly point, I had to first cycle up a short, but steep hill. I took a moment to stop half-way up the incline to take this silly selfie. Once I reached the peak of Howe Road, I began a long downhill descent (in the rain) before reaching a small, stone yurt which houses a tiny restaurant, restrooms and heated shelter. I parked my bike and ran inside, desperate to get out of the cold, wet weather. When I entered the building, I found myself surrounded by dry, civilized tourists eating warm meals in a comfortably heated interior. I, on the other-hand, was soaking wet and shaking from the cold. After returning from the restroom and waiting to dry out in a covered area near the door, I both saw and overheard a middle-aged woman berating her young, teenage son for some, small and ridiculous offense he had supposedly made. The mother was really letting the boy have it and you could tell by the look on the young lad’s face that he was thoroughly defeated. This was not the first time he had received such a talking to, nor would it be his last. The mother was completely out of line (even if the boy did do something to deserve of a talking to) and I felt sorry for the boy. I was so upset by this terrible woman that I nearly stepped in and said something… but in the end, did not. For the rest of the day this mean woman’s words were on my mind… and I wondered what would become of this young boy who is so obviously the victim of verbal abuse on a regular basis. There are times when traveling, when you encounter a situation and you don’t know what you, as a travel, should do. Should I have stepped in and defended the boy? Or should I simply have stayed quiet and let the mother “do her job” while I sat silently pretending not to hear what was going on? I’m not 100% sure what the boy did (it sounded like his only offense was not waiting for his mother before trying to run inside and get out of the rain), but I’m pretty sure that he did not deserve the verbal beat-down he received, nor the embarrassment caused to him by having his mother berate him in such a public environment. While the people inside the tiny seaside yurt worried about how they were going to get from the building to their car without getting wet, I jumped on my bicycle and pedaled for what must have been nearly twenty minutes to the top of the steep hill I had come down not more than an hour before and then cycled north into the city of Port Erin. I filled up my water bottles, loaded up on food for the evening, and then made my way north, up a super steep road and into a locked, hillside area used mainly by grazing sheep. I snapped the following photos in the steepest and most interesting part of this climb. That’s the city of Port Erin in the background and the Isle of Man’s most westerly point in the far right-hand side of the photo. Truth be told, I was pushing my bicycle most of the way at this point. The road was not only rocky, but also incredibly steep. Cycling uphill on my loaded touring bicycle was nearly impossible. At the top of the hill I decided to call it a day. Far from town, but not too far off the main trail, I pitched my tent in a wide open area where I knew it was possible a passing farmer, hiker or biker could easily spot my tent. I didn’t worry about it too much, however. I was so far up the mountain that the odds of a police-officer or some kind of park ranger making it up to me was incredibly low. I camped out in the open and waved confidently at the only two hikers who passed by my tent that night. It was cold and windy up there at the top of the mountain, but the views in every direction were absolutely magnificent. When the sun rose the following morning, I seriously did not want to emerge from my tent. My campsite on the hill above Port Erin was one of the best I have had in all my years of camping and bicycle touring all around the world. If only I had known the campsite would have been so good, I would have packed more food and water and simply stayed there for another night. But because my water supply was runny low (I drank a lot the night before after pushing my bike up that steep hill), I needed to continue on and get to a town where I could refill my bicycle’s water bottles. The bike ride between Port Erin and the city of Peel was by far the best stretch of cycling on the Isle of Man. Sadly, I didn’t as many photos in this area as I should have. It was cold and windy (which is how it was almost all the time during my bike tour on the Isle of Man) and I was anxious to get to Peel, so I could eat and rehydrate. When I did reach Peel, I was completely blown away. The city was small and charming, which a massive stone castle situated nearly on the water – a sort of floating masterpiece for everyone to view from afar or up close. After no more than ten seconds in Peel, I knew that I would be staying in this area for at least two nights. I parked my bike and took a short walk around the Peel Castle, but opted not to go inside because of the pricey entrance fee. After exploring the exterior of the Peel Castle and the nearby dock area, I waked my bike into the city center and found a sandwich shop, the local library, and an isolated park bench where I sat and ate my lunch. There was a campground in the city of Peel (the campground is just one of many campgrounds on the Isle of Man). Even though I needed a shower and the price of the campground was reasonably affordable (about 9 pounds, if I remember correctly), the place was a parking lot, filled with cars and campers of all sorts. After such a beautiful, isolated campsite the night before, I didn’t want to pay money to spend my nights in Peel camped out in a parking lot. So I cycled out of town a ways and began looking for a safe and secluded area in which I might be able to set up my tent for the next night or two. It took some time (about an hour) and a fair amount of uphill pushing, but I finally found a small patch of flat ground on the edge of a cliff overlooking the sea, and it was here that I set up my campsite for the evening. This would be, like the night before, one of the best campsites I have ever had – despite the cold, wind and rain that I would experience there. After a wonderful night of camping on the cliff, I packed up my tent and sleeping materials, but I did not pack up my bicycle in the way that I normally would. Because I planned to spend the day in Peel and return to camp in the same location that evening, I packed up my panniers and hid them in the bushes near where I was camping – in an area I was sure no one would find them. Then I cycled down to Peel carrying only the things I would need to get me through the day. This way, I would be free to cycle around Peel without worrying about all the belongings on my bicycle, and I’d be able to return to my cliff-side campsite that night without having to push my heavy bicycle back up the hill. Once in town, I bought food and water, and spent most of the day doing computer work at the small, local library. At one point in the day, while working in the library, a local restaurant owner came in to judge a cooking competition that had taken place amongst some of the children in the Peel area. It was fun to watch the pudgy judge eat and (try to) enjoy the numerous cupcakes that had been prepared by the local school children, and I was glad to have been trapped in the library so I could, in my own weird way, take part in this small island-nation cook-off. Because the library closed at lunch time, I ordered a SUBWAY sandwich from the city’s local franchise and then climbed up on a hill to find a park bench overlooking the city and the Peel Castle. Here, in relative isolation, I ate my lunch and took in the first totally sunny day I had experienced since arriving on the Isle of Man. Check out that blue sky! After eating lunch, I cycled past the Peel Castle once more and then returned to the library to do a few more hours worth of work. The librarian was nice, and only at the end of the day did she ask anything about me. I told the young woman that I was cycling around Europe for about five months and that I had been on the road for a little more than three months at that point in time. She was impressed and began to tell me how she, like many people from the Isle of Man, is into motorcycles and motorcycle racing. After saying goodbye to the librarian, I cycled out of the city, in the same way I had come the night before, and climbed back up the steep hillside overlooking the city of Peel to my remote cliff-side campsite where the panniers holding all of my earthly possessions were being secretly stored in the bushes. Upon arriving at my campsite, I found that my panniers had gone all day without being discovered, and so I went about setting up my tent and sleeping materials for the night. Check out the view I was able to enjoy from the front flap of my tent. Campsite views like this are just one of the many reasons I love bicycle touring and wild camping! When I woke the following morning, I woke to find that my bicycle’s rear rim had cracked and would need to be replaced immediately. While the wheel was still in tact, I feared that it might break apart at any moment, so I was fearful about the short 20 kilometer bike ride I would need to make back to the city of Douglas where the island’s only bike shops can be found. Hopefully one of those few bike shops would be able to help me repair my bicycle’s rear rim… and hopefully the replacement wouldn’t cost me an absolute fortune. Luckily, the bike ride back to Douglas was an easy one. After leaving Peel, the road to Douglas was relatively flat and straight. Cars zipped passed just inches from my bicycle, totally unaware that my bicycle’s rear wheel could explode and fall away at any moment. So I rode slowly and tried not to drive my bicycle over any major bumps in the road. When I reached the city of Douglas, I cycled straight to the nearest bike shop (Bikestyle Ltd on Bucks Road) and went inside to see if they’d be able to help me. To make a long story short, the people at Bikestyle were wonderful. For 50 pounds (about 80 USD) they built me a new rear wheel for my bicycle and even threw in a free seat post clamp (which I also desperately needed, because my old one was stripped and no longer holding my seat post and saddle in place). While my wheel was being built (it only took them about two hours), I walked around the city of Douglas and took a few photos. By the time my new wheel was ready, it was starting to get dark and I knew I needed to start searching for a place to spend the night. Because I had already spent some time in Douglas and I knew that the cliffs just outside the city were relatively isolated, I decided to return to the location where I had spent my first night on the island and camp in that same location once again. But on the way there, I was able to find an even better campsite (a small, flat area protected from the wind in a cliff-side car park). I’m sure I wasn’t supposed to camp there, but I didn’t care. I would only be there for a few hours… and I’d be waking up early the next morning to return to Douglas and take the ferry back to Dublin, Ireland. I didn’t sleep well that night – not because my campsite wasn’t good (it was great actually), but because I was nervous about missing my early 7 AM ferry back to Ireland. I’m not a morning person and I rarely ever wake up to an alarm, so when I must wake up early and be at a specific place at a specific time, it gives me a great deal of anxiety and I’m unable to sleep because of it. To make a long story short, however, I woke up early, before the sun had even begun to rise. I took down my tent, packed up my bike, and then cycled the short distance back into Douglas. I returned to the ferry terminal about twenty minutes before the necessary boarding time and then I waited. My time on the Isle of Man was over… and even though I had been cold and wet most of the time I was there, there were aspects of the journey that I thoroughly enjoyed. I wasn’t a fan of the busy, narrow streets or some of the more populated cities, but once I found myself on an isolated beach or up on a cliff far away from all the island’s other people, I found myself smiling again – enjoying the place I was in and the fact that so few people will ever get to experience a 6-day bike tour in a place as memorable as the Isle of Man. In case you’re wondering… 6 days of bike touring on the Isle of Man cost me $226.18 USD. It was $77.52 for the round-trip ferry boat ride from Dublin, Ireland; $80.00 to have a new rear wheel built for my bicycle, $60.31 for food; $8.35 for A SIM card for my phone; and $0 for camping. This entry was posted in Bicycle Touring Pro Articles, Darren Alff's Bike Tour Blog, Europe, Locations, Photos, United Kingdom and tagged bicycle touring pro isle of man, cycle touring isle of man, darren alff isle of man, douglas, great Britain islands, is the isle of man an island, is the isle of man its own country, isle of man, isle of man bike tour, mountain biking on the isle of man, peel, peel castle, peel isle of man, united kingdom island, where is the isle of man. IoM is still on my list of places to visit even though I live in Dublin. I think when I do I’ll spend a day or two in and around Peel since you make it sound so nice. 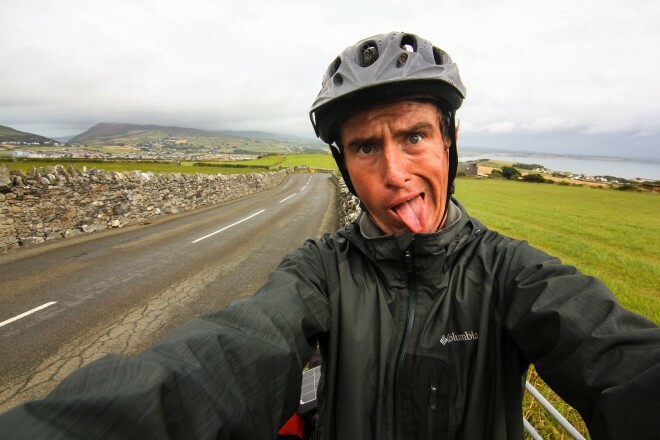 I LOVED this account of bike-touring on the Isle of Man. You are a true inspiration. Having done several walking tours in Britain, I understand the weather you faced, but your response was perfect: just accept it as a part of an overall wonderful journey. You are my hero. A nice account and cracking photos, thanks for sharing. Really enjoyed reading this. I have been to the IoM, but only by motorcycle. Nice! Loved to read all of it.